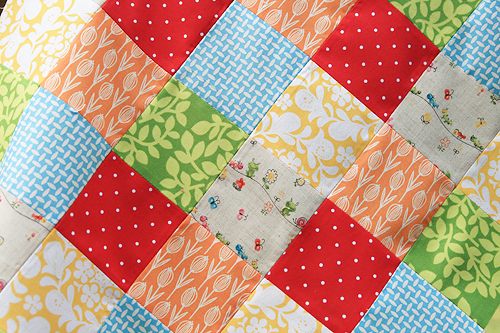 I was itching for some instant gratification today, so I decided to make a little patchwork mini quilt. Well, just the top was finished before the kids woke up from their naps. The star of the show is an adorable Japanese fabric I've been stashing for quite a long time. I added some of my favorite coordinating prints and I just think it really pops. Anyone else enjoy the smaller projects? I love making larger quilts, but sometimes these minis are just so fun and make me feel like I'm not taking f-o-r-e-v-e-r to finish everything.